Cinema’s face is has changed so vastly over the past few years, now we live in the interactive and social age cinema has evolved to accompany in part through the (overuse of) 3D technology and the bringing of cinema out of the basement and into the social – cinematic enterprises are making their show more social and in some cases truly interactive. Helped vastly by the ease of social media to spread word to the masses cinema is now back in the social and cultural. In this article I’m going to overview a few of London’s cinematic hotspots that offer something a little different that your typical commercial picture house. If you have some of your own please add them to the comments section. 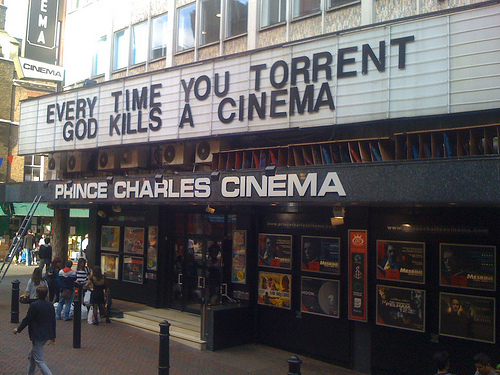 Words cannot describe the amount of love I have for this cinema which is why it had to be mentioned first. It is my most frequented cinema and the cheapest cinema in the west end. Its one of few cinemas where films will get (well deserved) applause at the end. I’ve had some of my most memorable cinematic experiences in that place – from the amazing crowd going nuts to every fight scene during a screening of the kung fu classic Snake Deadly Act, to the immense laughs during all the one liners at the screening of Commando. There is something for everyone in this place – whether you want to see one of those classics you were too young to see in the 70s to the current releases of today. The place also does yearly or lifetime membership making their cheap tickets even cheaper – shouts go out to my sister who got me the lifetime membership for my birthday. The Prince Charles also plays host to many a film festival – the most recent of which was the Terracotta Far East Film Festival where I caught a viewing of Tak Sakaguchi’s brilliant Yakuza Weapon which the man himself attended and answered audience questions afterwards (review coming soon). Continuing the subject of Terracotta Film this meetup group is run by Joey from Terracotta Films and Adam Torrel from Third Window Films, and is set up to meet like minded Far East Movie fans, talk, drink, watch films on a monthly basis. Each month there is a screening of a pre-release, current, classic or undiscovered Asian movie gems. The screenings have recently moved to the bigger Roxy Bar & Screen (reviewed below), but it used to be at Barrio Central & Peter Parkers Rock n Roll Club. Past films have included Mother, The Chaser, Villian, Fallen Angels, Audition and Adrift in Tokyo. As well as serving up some amazing food and drink these meet up sessions sometimes serve as an amazing environment to meet and talk to like minded Asian movie fans. Did I also mention that these meetups are free – click the meetup link to sign up and get details of upcoming meetups – get on it!!! Is it a bar, is it a restaurant or is it a cinema? Roxy Bar and Screen seems to successfully encompass all 3 equally and very naturally. Dim lights, red drapes, candle lit, comfy old school red leather sofas the place seems to really catch my vibe. The back of the bar contains the cinema and big screen with the seat and sofas – it has a homely speakeasy feel to it – it seats about 100 and has a 4 metre wide screen, whilst the bar itself is at the front – separated by huge drapes. Being a fully equipped bar and restaurant as well as a cinema the place has a great selection of reasonably priced food and drink. The place is first come first served for the seats and it’s the comfy sofas that go first, but with membership (£30 per year) you can reserve a sofa as well as get free entry to all their screenings and 10% off you food bill. Needless to say if I’m taking a date to a movie this is one of the first places I draw for, I’ve always earned brownie points with film loving dates that I’ve taken there. Sunday to Wednesday are screenings and sports, the rest of the week consists of films quizzes and club nights. Anyways on to the films: the films are typically £3 per person and consist of recent releases new to DVD as well as many foreign movies, and also documentaries and specials like the Twin Peaks marathon. The movie selection has seemed to have changed a little over the last year to less foreign and underground movies, but the place is still really worth checking out and comes highly recommended. My most memorable night there has to be Filmbar 70’s screening of the epic Punjabi Brothers movie The Stabilizer (review coming soon) which is a Indonesian knock off of Sly Stallone’s Cobra and is one of the most amazing action movies ever!!! Power to the people!!! 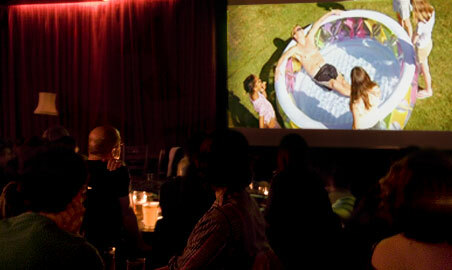 Recently given their marching orders, this place deserves and honourable mention – it was the ultimate “squat cinema”. Located in an ex serviceman’s club in Brockley – the huge basement bar was transformed into a squat cinema every Saturday showing an array of amazing movies. It had the same sort of feel as The Roxy with its old sofas and serving up food and drink to have during the movie. The exact location was never revealed due to it being a squat and ran a free first come first served weekly guestlist. As well as showing some amazing movies The People’s Picture house served the cheapest and tastiest mojitos I’ve had in a while and vegetarian food. I had the pleasure to catch Ghost in the Shell: Innocence b2b La Jetee in there. Other films that were shown were Paranoid Park, Armadillo, and S. Hunter Thompson double bill and a Werner Herzog double bill. Unfortunately they were given their marching orders from the venue last month. Here’s hoping that one day they find somewhere new – my fingers are cross – power to the people!!!! You cannot mention the changing face of cinema without talking about Secret Cinema. Run by Future Shorts Secret Cinema has most definitely played a huge role in the movement of this increase in interactivity and bringing cinema into the social. Under the tagline “Tell No One” Secret Cinema brings us the best in interactive cinema. From its humble beginnings 2007 when their events were attended by just a few hundred people – Secret Cinema has grown to having up to 16, 000 attendees for their shows and their facebook page – has an huge 95, 000 followers! So what is Secret Cinema? It is created for those who want to do more than simply watch a movie. You’re never told the film before the movie but are given clues and dressing up (yes I said dressing up) instructions sent through Twitter & Facebook in the weeks before the showing. Secret Cinema have taken movies out of the the normal cinema and put them in weird and wonderful locations from Tobacco Docks for their screening of The Red Shoes to a disused childrens hospital for their screening on One Flew Over the Cuckoos Nest. Expect more than an usual cinematic experience. Each unique location for the movies are full on set designed that revolves around the film as well as their been over 100 actors full dressed up reacreating aspects of the movie before it starts. Fabian Riggal Founder of Secret Cinema explains the concept in this BBC Interview. You cannot mention the future of cinema without Secret Cinema – its a recommended experience. 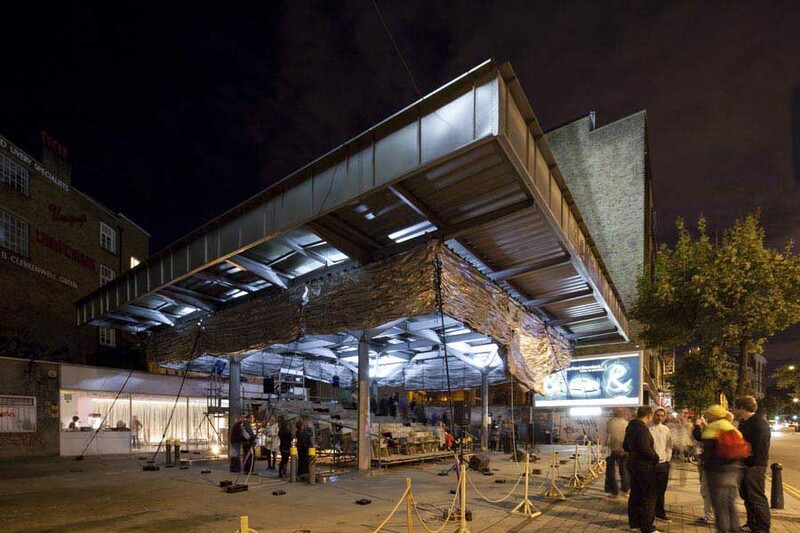 There are many “pop-up” cinemas that do short runs across London – here are a few of them….. 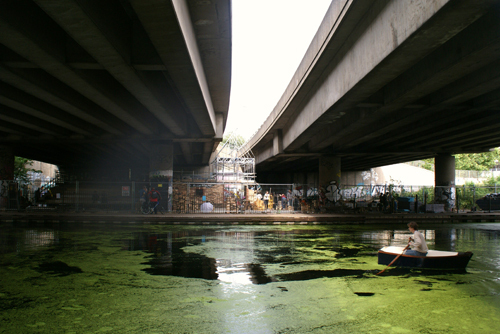 It seems like Hackney Wick is the place for popup cinemas. 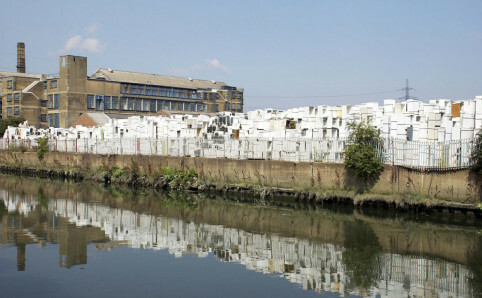 Located onFishIslandnext to the new Olympic site this area was once Europe’s largest mountain of discarded Fridges. This and the Olympics at this same time next year has been the inspiration for this pop up cinema. Running from 27th July until 13th August. Presented by The Hackney Picturehouse Cinema Films for Fridges pays homage to the Olympics by showing a host of sports-centric movies. The site itself was built with the help of SIMS Recycling using reclaimed fridges!!! Movies being shown include Rocky, Chariots of Fire, Cool Runnings, Breaking Away and the UKpremiere of the sports documentary Pelada. It’s going to be another one where pre-booking tickets will be essential. Please check the website for full details. 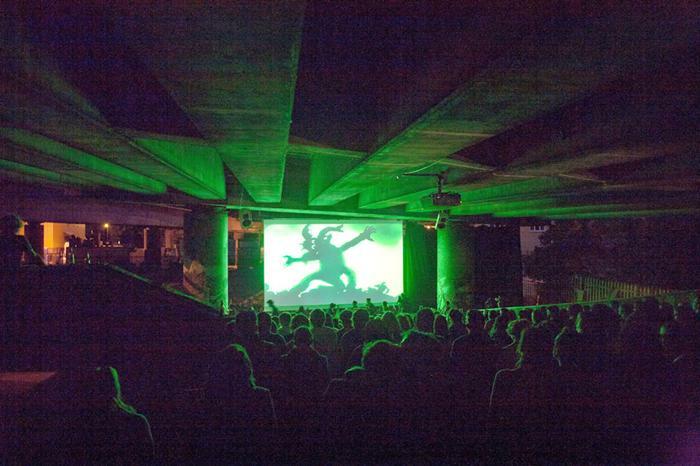 Presented by west London’s Lexi Cinema (another great cinema to check out that I’ve not mentioned in this article) this is the UK’s first roaming pop-up cinema, bringing movies to a variety of both indoor and outdoor venues across theUK. 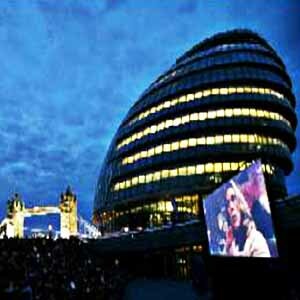 Expect Film4’s Summer Screen meets Secret Cinema with the surroundings themed in tune with the movie. 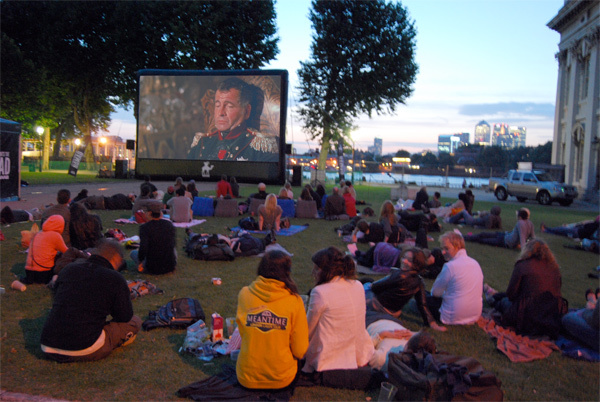 Over the summer months they have taken to the Royal Parks for an outdoor cinematic fest of fun. The venues include Kensington Gardens, Victoria Tower Gardens, Richmond Park, Brompton Cemetery for special showing of Pan’s Labyrinth (this one will be massive) & Regents Park. …time for a few cinema with amazing bars!! Located in the heart of Soho words cannot describe the love I have for this venue. I refer to it as a venue because my time there is divided between its cinema, its amazing bar and its Tabac Cafe. 80% of the time I visit the place I’m not even watching a film. The ground level cafe serves up some excellent coffee and those Konditor & Cook cakes. The descend to the downstairs bar which has plenty seats and sofa & cinema memorabilia and related art donned on the wall. The bar is cozy and find myself in there for a drink quite a bit. The bar is fully licensed and they have a nice range or beers, wines, spirits & cocktails – the dark and stormy being my most ordered cocktail in their. You’ll find that the place is full of people not watching a film and just in there for a drink the bar is that good. 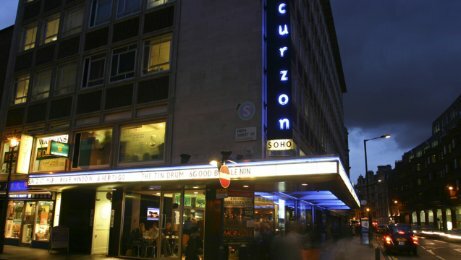 If you’re on a movie date the Curzon Soho is definitely a good place to hit up with some pre-drinks & coffee. As for the movies – the Curzon is one of the best arthouse cinemas in London – its has 3 screens showing the best in arthouse cinema. They also have plenty of one-off screenings and the excellent Midnight Movies – where they show a late night movie with a pre-party in the bar related to the film – one recently showing being Battle Royale. The cinema also has its own bookshop and DVD store. The cinema chain also releases its own free magazine which has all its listing of up coming events and well as being full of film reviews and interviews – its an excellent read. Continuing with the cosy date vibes – you cannot mention dates and cinemas without mentioning The Everyman Hampsted. More expensive than the other cinemas, but if your on a cinematic date its the perfect place to go. Chilled vibe, intimate bespoke seating with tables for food, and a good selection of food and cocktails this place is the one for a date. The place has armchairs as well as cosy two seater sofas with areas for food brought to your table before the movie – its the one. Like the other Everyman cinemas out there they show a selection of both art house movies and current releases, as well as special events like the Met Opera shown via live feed from New York. …..and now on to some outdoor cinematic London experiences – and remember to always keep that umbrella in tow – this London summer weather is so bipolar right now!!! I haven’t been to any of these screenings yet but I have been on the rooftop garden of the Queen of Hoxton for many a party – sometimes a little hazy and not knowing exactly how I got there. It’s an amazing spot to be on during these “so-called” summer months and now they are showing movies 5 days a week. The set up is a huge screen, seats and wireless headphones pumping through the movie sounds. 5 days a week they are showing classics like Mad Max, The Goonies, Coming to America, Taxi Driver and Raiders of the Lost Ark. Accompanying this you have the Queen’s great selection of food and cocktails. I haven’t been to these screening but from what I know of the Queen of Hoxton rooftop I’d recommend this and from this rate that the tickets are selling out it looks like this is the summer spot to hit up!!! Located by City Hall this is an outdoor amphitheatre, that shows a wide range of movies and performances during the summer months. The season of movies starts in September, up until then there is a range of music and theatre. This September the movies include more recent releases as well as classics such as The Kings Speech, Grease, True Grit & Dirty Dancing to name a few. Check the site for full listings, but being September also look out for the weather. The time of the year has come round once again for London’s biggest of the outdoor summer screens. 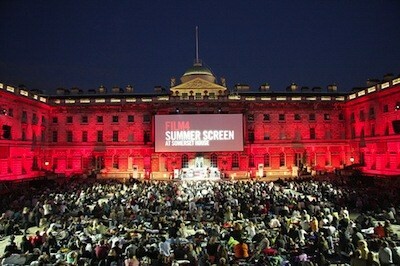 Time to get out those blankets and cushion for the strictly social Film 4 summer screens at Somerset House. Get in on these quick as they sell out instantly. As always some of the best of London’s DJs (they really need to book me :P) will be warming up proceedings with films starting as it starts to get dark. There is a wide range of movies this year both new and old – from the UK premier of Pedro Almodovar’s The Skin I Live In, to double bills of Shaft & Serpico and the showing of the legendary The Princess Bride – get on these quick before they sell out and you’ll be kicking yourself – its always an amazing atmosphere at these screenings. but thats all for now – there will updates of new sites on this site as I find them. they refurbished it all last year with lotery grant.. still got the old feel to it. dustin hoffman in last week!! !